PrintBackA Multi-Activity Stay in the Maritime Regions of Québec, for a Great Holiday! Sea kayaking, hiking, wildlife observation, interpretive activities, etc., there’s so much to do in the maritime regions of Québec. If you have little time, but the head full of projects – whether you come in the summer or in the fall when nature puts on her most beautiful colours – a stay at a resort offering lodging and various activities is likely the perfect solution for you. Here are a few ideas. Located on the banks of Lake Pohénégamook, Pohénégamook Santé Plein Air resort has everything to please you, whether you’re travelling with the family or with friends. It offers various lodging options (inn, cottages and cabins) and a multitude of possibilities to keep you busy: from water-based activities, such as lake and river canoeing, kayaking and sailing, to climbing, hiking and cycling, to nature interpretation and regional history. On-site, you’ll also find an indoor pool, a health spa and a dining room where you’ll have the opportunity to savour well-diversified home-style meals. You wouldn’t miss the chance to stay in Eastern Québec’s largest log inn, would you? 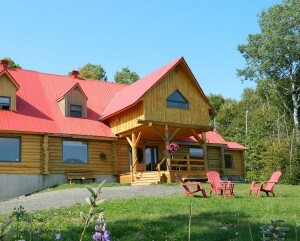 Then, you should head for beautiful Domaine Valga, in Saint-Gabriel-de-Rimouski. The inn has six rooms, each with its special character, as well as a dining room, a reception hall, a meeting room and a lounge. You can also stay in one of the two cottages, both fully-furnished, including shower and electricity, and accommodating up to 9 people. Domaine Valga boasts an aerial park, La Forêt de Maître Corbeau, consisting of 94 treetop challenges, located in the heart of a unique old-growth forest in the Bas-Saint-Laurent region. Thrill-seekers will be delighted! Located in ideal beaver territory – which is perfect to observe the animal in its natural habitat, the resort is also at the crossroad of many hiking, quad and cycling trails. If you’re rather looking for a vacation in a maritime environment, you’ll be charmed by Île du Pot à l’Eau-de-Vie and Île aux Lièvres. These islands are home to important seabird colonies and rank among the best sites to watch belugas. You’ll also be able to see seals wash up along their shoreline. 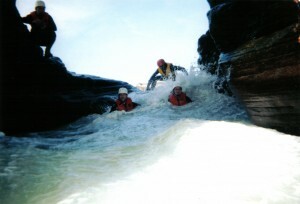 Managing and protecting these islands, Société Duvetnor offers several types of sea excursions. Explore Île aux Lièvres roaming its 45-km network of hiking trails. Make sure to spend one or several nights on the island, whether at the inn, in a cottage or at one of the rustic campgrounds. Or experience the unique feeling of spending the night in a former lightkeeper’s house on Île du Pot à l’Eau-de-Vie. Did you know that the Bonaventure River, in Gaspésie, is one of the clearest rivers in the world? Cime Aventures offers a wide range of activities, guided or not, on this magnificent river: canoeing, kayaking and rafting. If you prefer the ultimate comfort to experience the river, choose a rabaska excursion, a traditional bark canoe used by Indigenous people. And what more can you ask for after a fun-filled day in the outdoors, but a good restaurant – which, as a bonus, serves dishes made from local products – and a spa area to relax? Lodging options are many at Cime Aventures. From eco-lodges to camping, to teepees and rustic yurts, you’ll find various types of accommodations that’ll make you feel like you’re in a different world! If you’re interested in wildlife observation, the Ferme 5 Étoiles holiday resort in Côte-Nord will please you with its various animal species on-site (moose, wolves, cougars, buffalo, deer, etc. ), its natural environment and its vast spaces by the Saguenay Fjord. The centre offers numerous activities, including whale-watching, sea kayaking in the Saguenay Fjord, horseback riding, hiking and quad excursions. Kids have the opportunity to participate in the morning chores; they’ll be delighted to help the animal attendant feed the animals and gather eggs! Different lodging options are offered (cottages on-site or closer to the fjord, B&B, yurts, campground, teepee, etc.) and the inn serves delicious home-cooked meals, in a warm and family-like atmosphere. Located in the Grande-Entrée area of the Îles de la Madeleine, Auberge La Salicorne offers full packages, including lodging, meals and a wide range of activities for you to choose from. You’ll find everything you need for a rewarding vacation in the authentic atmosphere of the islands, from wildlife and flora interpretative and observation activities; to guided tours to discover the islands’ stories, legends and landscapes; to water-oriented activities, like canoeing, pedal-boating, kayaking and rabaska tours. Parc de Gros-Cap is the place where kayakers hang out in the islands. Easily accessible via a beach, the coastline around Gros Cap, dotted with cliffs and caves, is protected from prevailing winds. The park offers short kayak trips of a few hours to longer expeditions of two days or more, as well as courses accredited by the Québec Canoe and Kayak Federation (FQCK). The Îles de la Madeleine International Youth Hostel is located on-site. There is also a campground with over a hundred sites and five ready-to-camp rustic cottages called “Salines”. Located on a cape offering stunning vistas on the St. Lawrence Gulf and on Île d’Entrée in the distance, Parc de Gros-Cap is a good place to observe many seabird species, including the famous black guillemots. The perfect setting to end a busy day! And what about national parks? 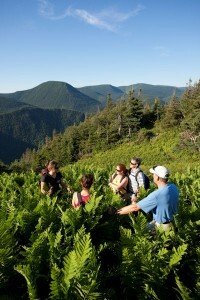 Offering many discovery and interpretative activities to learn more about wildlife, flora and history, as well as a unique environment for many outdoor activities on solid ground or on the water, the national parks of the maritime regions of Québec are also great destinations for multi-activity stays. And in order for your type of lodging becomes an activity in itself, Parc national du Bic, Parc national de la Gaspésie, Parc national du Lac-Témiscouata and Parc national du Fjord-du-Saguenay offer ready-to-camp tents (see top photo), and sometimes in tent-trailers. If you prefer a “more comfortable” accommodation in Gaspésie National Park, you have the option of staying in the well-renowned Gîte du Mont-Albert. Perched at an altitude of 615 metres (2000 feet) in the Chic-Choc Mountains, the Auberge de montagne des Chic-Chocs offers friendly lodging in a natural setting that can’t be beat! Guests have access to over 100 km (60 mi.) of mountain bike trails and some 50 km (30 mi.) of hiking trails that they can explore with or without a guide. 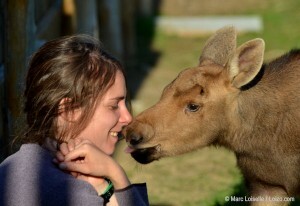 And the area boasts a very high concentration of moose, so your chances to see the king of our forests are excellent. The “Mountain Stay Package” includes accommodations and meals, as well as the service of experienced guides and equipment rental for the activity of your choice. Whether you’re travelling with your partner, family or friends, a multi-activity stay in the the maritime regions of Québec promises to be an unforgettable vacation, whatever you’re looking for. Don’t wait any longer; start planning your vacation in our regions today!